In my opinion my grand mother was the best cook I have ever Known; I searched until I found a cook that reminded me of my grandmother, s cooking; it was my intention to eat most of my meals in the restaurant; As a rule I did not like frequenting restaurants If the owner or the family did not eat from the menu. A wise lesson one should learn about known restaurants. The official opening of The Beer House took the form of a Beer Party; Guests were charged a nominal fee and all beer were free from 7pm to 11pm; you had to return an empty bottle before you was offered a refill. All the suppliers were approached beforehand to provide some free samples in order to help defray the cost; The attraction for the suppliers was an opportunity to promote their brands. The Beer House was set up with a small music booth with high quality sounding equipment; selected by a friend who was a DJ; he himself was hired as the DJ for the opening night. He was only allowed to play selections that were on sale in our music section in the gallery and gift shop on the first floor. Miss Laura was on hand to cook for the night, there was a special promotion price and a single menu; The choice of a single menu was based on my experience of eating out in restaurants throughout the world; My taste buds would react negatively whenever I saw a large menu;They sent me a message that it cannot all be freshly cooked; and sometimes you can tell because the defrosting process was not properly conducted. Two of the most popular dishes for local Bajans were cou cou and flying fish and Beef stew, pigeon peas and rice; The policy for the time the restaurant was in operation under my management was to have one special per day. An estimated amount was cooked in large pots; when the special was finished, the only other items on the menu were steaks and hot dogs; If any Rice and Stew was left back at closing time,the staff were allowed to talk it home at no cost; Those days were few and far between. In the beginning there was an argument with Miss Laura, she said in all her years of working in restaurants she never experienced any restaurant not serving leftovers; I told her there was always a first time; my rule is freshly cooked meals every day, and that is how it stayed until the day of sale. The opening was a banger, a few people got drunk on too many beers, a couple had a competition to see who could drink the most beers, the loser had to pay the competitor the cost of the beers, there were a few who tried to ask for more beers before finishing a bottle, the rule of returning the empty bottle was a wise decision. The beer parties continued every first Saturday night in the month until I finally sold the restaurant a couple years later. The music was a success, Reggae was new to the Island, the radio stations rarely played it, and only one other record shop on Island sold a limited selection. The following Monday several DJs and attendees at the beer party were in the gift shop purchasing some of the selections that were played on the night of the party. Stories about Miss Laurs”s cooking and the attractive portions got around,we began to attract a regular clientele for lunch,they came mainly from the government offices, commercial banks, departmental stores and Insurance agencies. some Office and hotel workers came in after work to sample the different brands of beer; the draft beer was even a hit with the locals. The art market was slow to grow, the local handicrafts were doing much better and tourists were happy they could purchase local pottery and wood craft. The most successful items were straw placemats and hand bags made from the leaves and the roots of the pandanas Plant that acted as a wind-breaker around many local homes. 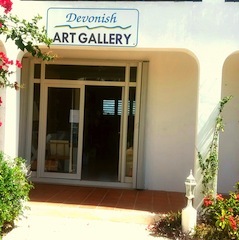 As the news spread about the art gallery and gift shop, we developed a lucrative market with the Villas owned by wealthy expats and some hotel owners and managers, who saw the wisdom in supporting local handicrafts.crafts.